Choose a trackball over a traditional mouse to help with hand / finger support (e.g., reduce fatigue and strain), if you have small space to work in or just prefer a stationary mouse. With the trackball, the cursor movement is typically thumb-controlled by rotating the ball, so there is no need to slide around a mouse or move your arm just to move your cursor on the screen. With a more sculpted shape to the device (since it can be larger as it doesn’t need to be moved), it supports your hand for comfortable control all day long. The size, shape and contours of this trackball mouse are great for most hands (although it is only for right handed). The buttons are positioned well for easy use, as are the scroll wheel and trackball. The buttons have a good pressure to engage and have a satisfying “click” sound. What makes this our top choice is that you can use it all day without getting hand fatigue, finger cramps or arm pains. Communication between the trackball mouse and your computer is through a small USB dongle that sticks out about a quarter inch from the port. This is Logitech’s “Unifying Receiver”, and a single receiver can communicate simultaneously with multiple wireless Logitech devices, for example a wireless keyboard. The mouse itself is powered by a single AAA battery (included). Logitech claims an 18 month usage between battery changes, and we can report that after testing this for over 6 months that the battery is still going strong. In addition to the usual 2-buttons (left-click, right-click) and scroll-wheel, the M570 has two new buttons, next to the left-click button, for moving Back and going Forward when browsing websites or documents. The scroll-wheel is made of a soft rubber and gives a nice feedback with subtle “stops” as it turns. For best ergonomics, you would use your middle finger to move it. The wheel can also be pressed down, making it the 5th button of this device. Last is the blue trackball which moves smoothly and easily, controlled by your thumb. Internal to the trackball is a laser/optical sensor, which allows the ball to move freely while allowing for precise movements. All of the buttons as well as the scroll wheel and trackball are programmable and customizable, although most people will just leave them with the default settings in place. This works with both Windows-based computers (XP, Vista, 7, 8, 10) and Mac computers (Mac OS X 10.5 or later). It may take a little getting used to, but once you get the hang of it this trackball mouse is better than a regular mouse. Especially if you are working in a small space. While this device is the least expensive of the all the trackballs in this review, it has the best overall feel and all the features you’ll need. For these reasons, it earns our top spot. Our first runner up is also from Logitech. The MX ERGO is similar to the M570, with a slightly less curved design and a little bit larger overall. What makes this standout is the unique adjustable hinge at the base. This allows you to customize the trackball angle from 0 to 20 degrees for a more natural, comfortable hand position. This was the only trackball mouse we found with this feature; the extra adjustment can reduce wrist strain and may justify the higher price for many people. Another feature is that this mouse can be used for navigation between two computers. The small button near the scroll wheel lets you select between computer one and computer two with a simple press. This helps to reduce the amount of work space you need if you have a two system set-up. With Logitech’s “Flow” utility installed, you can also copy/paste/move text, images, documents from one computer to another. This works even when one computer is a Mac and the other a Windows PC. 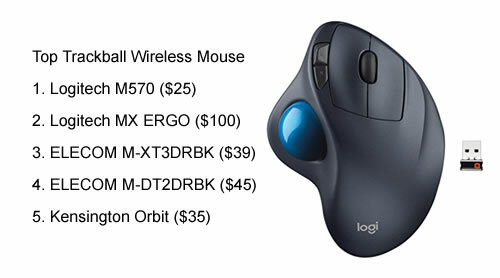 Unlike many other wireless trackball’s, the MX ERGO has a rechargeable battery which lasts about 4 months before needed a top-off. The included micro-USB cord will fully charge the trackball in under and hour. If you need a quick charge and go, in about a minute you can charge enough to get you through the day. The M-XT3DRBK is slightly smaller and little flatter in profile that the Logitech, but still a good ergonomic fit for your hand. It is also available in a left hand configuration , which we haven’t typically seen with other trackball manufacturers. This trackball mouse makes the list for two special features. The first is a button just below the scroll wheel which lets you select between standard resolution (750 dpi) and precision resolution (1500 dpi). Moving the button lets you move faster across the screen which is important for many video games, or lets you have fine control for editing documents and graphics. The second feature is the pulse tilt wheel. Similar to the push button aspect of other mice, the tilt function lets you scroll from side-to-side or flip landscape screens while working on a spreadsheet. Also, while not essential to the trackball operation, there is lighted battery display next to the scroll wheel to let you know how much (approximately) battery power remains. With a 4 month usage time on a battery, this will let you know when it’s time to get some new AA’s. What makes this trackball mouse interesting is that the location of the trackball and the scroll wheel are switched from what is typically found. For this configuration, you use your index finger to roll the trackball, and your thumb for the scroll wheel. This positioning is supposed to be better for your fingers and hand joints by creating a more natural movement. It takes a little getting used to, but may actually be a better orientation than the standard trackball location. This trackball had 8 buttons for left, right, back, forward, 3 function buttons and wheel button. It also offers all of the features of the M-XT3DRBK discussed above. Our last recommendation also has a different configuration that the previous trackballs. The trackball is centered on the device, which makes it usable for either hand. Instead of a scroll wheel, Kensington has a scroll ring. The ring is touch sensitive, and completely encircles the trackball. Sliding your finger clockwise is like scrolling down, and counterclockwise is like scrolling up. This is a neat design, and with a little practice works really well. There are only two buttons, located on either side of the device. With the side button placements, you need to drape your hand over the device. Depending on the size of your hand and/or length of your fingers, this may work very well or not at all.